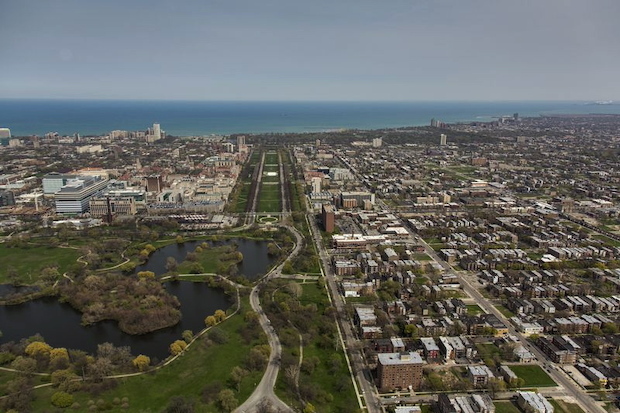 Washington Park (front left) is connected to Jackson Park (seen in distance) by the University of Chicago's Midway Plaisance. WOODLAWN — Barack Obama has picked the South Side as the home of his presidential library, but has delayed selecting a site, setting the stage for a potential battle between the two neighborhoods vying for the multimillion dollar library. But community leaders said they will fight to maintain unity as the Obama Foundation spends the next nine months deciding whether to locate the president's library on about 20 acres of land in Jackson Park in Woodlawn or in Washington Park's namesake park. “I think that there will be guidance in such a way that the competition won’t escalate into power blocks,” said the Rev. Richard Tolliver of St. Edmund’s Episcopal Church at 6105 S. Michigan Ave. in Washington Park. The Rev. Byron Brazier of Apostolic Church of God in Woodlawn and other religious leaders pledged to curb competition between Woodlawn and Washington Park as the Obama Foundation debates between the two as the home of the Barack Obama Presidential Library. The Rev. Byron Brazier of Apostolic Church of God at 6320 S. Dorchester Ave. in Woodlawn predicted that a sense of competition could flare up as it becomes clear how the decision will be made. St. Edmund’s and Apostolic are both taking the lead in trying to transform their neighborhoods for the better, and Tolliver and Brazier both said the library would be a catalyst for the affordable housing, economic development and education initiatives happening in their communities. Groups in Washington Park already are adding caveats for the library coming to their neighborhood. The Bronzeville Regional Collective for the Obama Presidential Library and Community Economic Development Benefits has started drafting a community benefits agreement it wants the Obama Foundation and the city to sign off on before the library comes to the South Side. “We want to make sure we’re in a position to get the benefits,” said L. Anton Seals, a founding member of the group. The group wants the foundation to set up a fund to help small businesses and homeowners stay in the community if the library brings the economic boon that is promised. 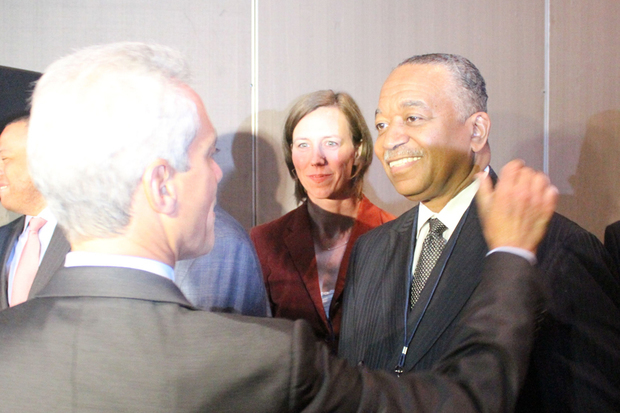 Groups in Woodlawn have expressed similar desires for investment in education and economic development, but Brazier said they will not seek a formal agreement. The Obama Foundation has repeatedly stressed that the library is being brought to the South Side because of the benefits it could bring to Washington Park and Woodlawn. Nesbitt has not yet outlined what the community benefits would include. There are a host of groups that could all benefit from seeing the Obama Foundation choose one neighborhood over the other. The Rev. Torrey Barrett of Life Center Church of God in Christ in Washington Park and the Rev. Leon Finney of the Woodlawn Community Development Corporation have both worked closely with Brazier and Tolliver to get the library to the South Side, but have their own projects that would benefit from one neighborhood being chosen over the other. "Whatever neighborhood doesn't get it will still be part of the process — but we're pushing for Washington Park," Barrett said. Barrett said he continues to build stronger connections between the neighborhoods, and said Brazier was recently added to the board of the Washington Park Consortium, the community development organization helmed by Barrett. Finney was not available to comment. She predicted the process would remain amicable and infighting would be avoided as the Obama Foundation researches both sites. Susan Sher, who coordinated the university’s bid for the library, echoed Newsome’s optimism. Brazier, Tolliver, Newsome and others all said the key to avoiding competition between the neighborhoods is to continue working together under the notion that both communities will benefit regardless of which site is chosen.